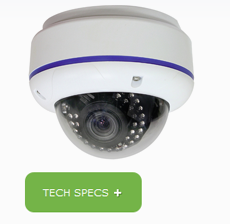 JNC Communications offers a full line of cameras for every need and budget. 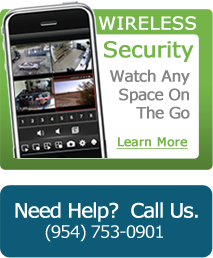 Contact us to help you design your perfect security needs. 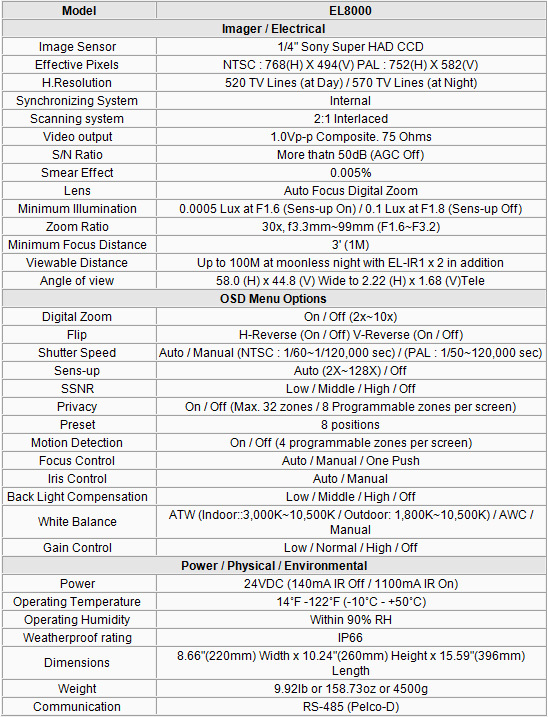 View a small selection of our cameras below. The new, feature-rich EL8000 brings more than cutting-edge style. It also brings you the power of sWDR with an integrated Active Infrared system. With the built-in 30X (f3.3~99mm) optical zoom lens and 10X digital zoom function, the camera provides 300X of zoom capability. Users can utilize the RS-485 interface remotely to manipulate the zoom as well as all of the cameras internal functions via the DVR. The EL-8000 is fully weather proof and is rated at IP66. It has 6 built in IR's that can illuminate up to 150ft. If longer distance of intelligent IR is needed you can easily connect the EL-IR1 illuminators on the spot to give it up to 300ft. There is also built in motion detection lights on the side that flash red when motion is sensed and stay blue when idle. The El-8000 features "Serve Ease" which allows you to remove the camera from it mount without disconnecting the camera from the wall. This feature makes service and installation quick and simple. The camera incorporates an Intelligent CDS control technology that triggers the mechanical day/night filter accurately. This filter is switched on and off with the image changing between Color and B/W at 5 lux outdoor darkness. 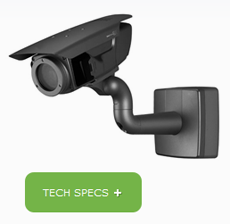 The EL-470 is a weatherproof, vandal proof outdoor dome camera containing a user-friendly configuration menu. It incorporates a perfect and tool-free 3-Axismount with which the camera can be installed on the wall, on the ceiling or on the slope with no limitation, wall mount bracket is available (optional). The EL-470 produces600TVL (Day)/630TVL(Night) High Resolution with 1/3 Sony Super HAD CCD II and color signal removal technology at nighttime. Highly improved image process engine and Sens-up technology detect subject clear in B/W mode. 3D adaptive Noise Reduction Filter effectively removes the noises from the image signal under the low light and helps to reproduce a more vivid and clear image. With the built-in SSDR(Samsung Super Dynamic Range) technology, the unit can make the selected highlights masked and the dark brightened simultaneously to capture the numbers on the License Plate clearly at nighttime. 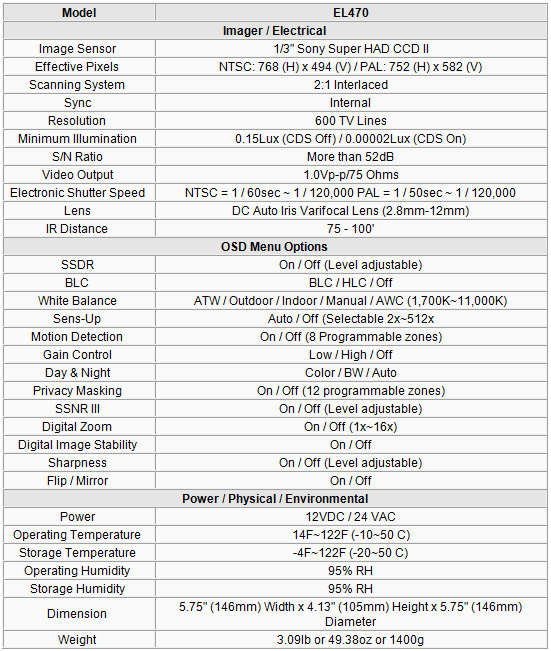 OSD function. IP66 Weatherproof.